As per the news published on TOI, JSS AHER is going to launch its distance education courses soon. As per the report published, JSS will join hands with Karnataka State Open University and University of Mysore to offer distance education courses in India. If things to right, JSS may start offering these courses post June this year. Initially courses in Life science and hospital management will be offered along with some certification programs. After that some new courses will be added. There is no information available about the name of the courses. Most probably, only higher education courses will be introduced in the first phase. MBA in hospital management will be one of the courses offered by the University, confirmed the university registrar. The university will focus on online learning, and new courses will be added based on the demand. Hands-on training programmes and weekend classes will be provided to students who will join the distance education courses from JSS. The Ooty campus of the university will also get these courses. That means people from the Tamil Nadu state will also get benefited from these courses. Last year, distance education bureau has allowed private universities to run distance education courses, and this is the outcome of that decision. Earlier only state run universities were allowed to offer distance education courses. Distance education bureau is making so many changes in how distance education is offered. Many new notifications are coming from UGC to make distance education better. The ultimate goal of all of these steps is to make distance education well-regulated and improve the quality of distance education in India. We have also heard that many universities are barred from offering distance education courses this year. The future of distance education looks bright in India. The Annamalai University Directorate of Distance Education was established in Tamil Nadu in the year 1979. The University is one among the few Indian Institutes that are well sophisticated. The University now has 49 Department under 10 faculties, over 500 courses under the Distance education programme that ranges from the undergraduate to post-graduate courses, a certificate to Diploma courses and many. Bachelor of Business Administration is an undergraduate course, and every +2 equivalent qualified individual is eligible for the admission into this undergraduate course. The BBA course includes the study of basic to the advanced study of Business and Finance management in the duration of 3 years. For the aspirants with the career desire in the Business management sector, the BBA is the pathway. After graduating with BBA, the candidates can opt for the post graduate courses like MBA for the better scope of career in the industry. The BBA programme through the Distance learning mode is a three-year course. The program offered by the Annamalai University is based on the standards and norms prescribed by the University Grants Commission (UGC), and approved by the same. The course offered for three years encompasses the study of Managerial Economics, Management process and organizational theory, Business correspondence, Business Psychology, and Behavioral Sciences, Marketing Management, Financial and cost accounting, Business Finance, Human Resource Management and many core subjects that give the candidates a complete analytical knowledge about Business and Finance. The admission process can be done in two ways online or offline through posts and later the counseling is conducted by the Directorate of Distance Education where the original certificates of the candidates are verified and the seat is allotted. The seat allotment is completely merit-based. Visit the official website of the university find the Directorate of Distance Education section and proceed with the following. Fill up the required and mandatory fields, the candidate is supposed to choose the study centers in their region. Provide valid 10-digit mobile number and email address as the candidate will receive the further information on the same. Fill up the complete details in the form and click on the “Continue” Button to proceed. After the candidate has successfully submitted the application form, a successful registration message is displayed on the screen with a program code that has to be noted for the further proceedings. Click on the “Pay Online” button to continue. The amount the candidate is required to pay is Rs.100/- for the application proceeding. The amount can be paid through Net Banking, Debit Card or Credit card. After the amount is successfully paid to save or print the transaction slip for future reference. After the payment, the candidate may receive the application form with the application number via the email address provided by the candidate. Later the candidate is required to fill the admission form with the referred application number received and pay the tuition fee through Net Banking, Debit card or credit card (Visa, Master, Mastero, Rupay). The candidate while registering offline can send the duly filled application form with the attested Xerox copies of all the required certificates to the “Directorate of Distance education, Annamalai University, Annamalai Nagar – 608002”. Note: While Applying through offline through posts the candidates must bear in mind to not enclose any of their original certificates and demand draft along with the application form. After receiving the candidates’ application, the University will provide the admission card to the candidate via post and then the candidate will be finally admitted only after the counseling where the candidate’s original certificates are verified. The candidate must have a Pre-University/ Second-year foundation/ Higher Secondary Examination/ Three-year Diploma/ Two-year Diploma in the Teacher Education programme or an equivalent qualification. Apart from the course fee the additional fee includes the application and prospectus fee of Rs.100/-, the cost of the books for each year is Rs.1500/- which makes it a total fee of Rs.4500/- for books for all three years, and the exam fee will also be announced by the University prior to the exams. 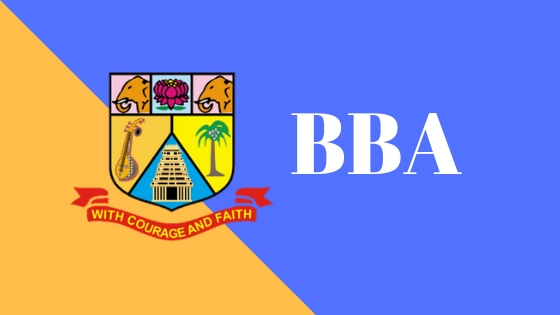 The Annamalai University Directorate of Distance Education provides the reservation for the candidates under the following categories with accordance to the rules of Government of India. The scholarship for different categories of students is provided as per the Indian government norms. 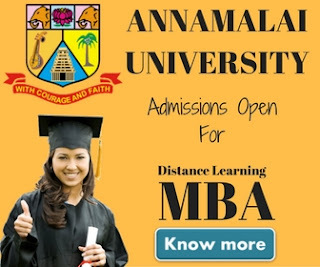 The Annamalai University Directorate of Distance Education is one of the well-established and most recognized institutions in India and is known to have the largest enrolment in India. The University is well-equipped and sophisticated with adequate and high-quality teaching staff. Therefore, it proves to be a better option for a candidate to pursue their BBA distance education Programme. Mumbai University Distance Education: University of Mumbai or Mumbai University is one of the oldest & popular universities in India. It is among India's first three universities. Mumbai University was established in the year 1857. The University is known for its quality education & beautiful building. The University has been re-accredited with ‘A’ grade by NAAC. Mumbai university has two campuses and 669 affiliated colleges. In the year 1971, Mumbai University started correspondence courses to help students who otherwise don't have easy access to higher education. Initially, the correspondence courses were being offered under Directorate of Correspondence Courses, which later has been upgraded to Directorate of Distance Education in the year 1985 and further upgraded to Institute of Distance Education (IDE) in the year 1993 and now in the year 2008 IDE has been further upgraded as Institute of Distance & Open Learning. As of now, Mumbai University has a strong base of more than 80000 registered students under distance learning mode. Not only just students, many film personalities are also pursuing courses through IDOL. To position IDOL as a premier ODL institute responsive to emerging needs of learners by providing education for all. To produce high quality graduates and contribute towards sustainable development of the university by supporting creation of excellence in teaching, learning and research. 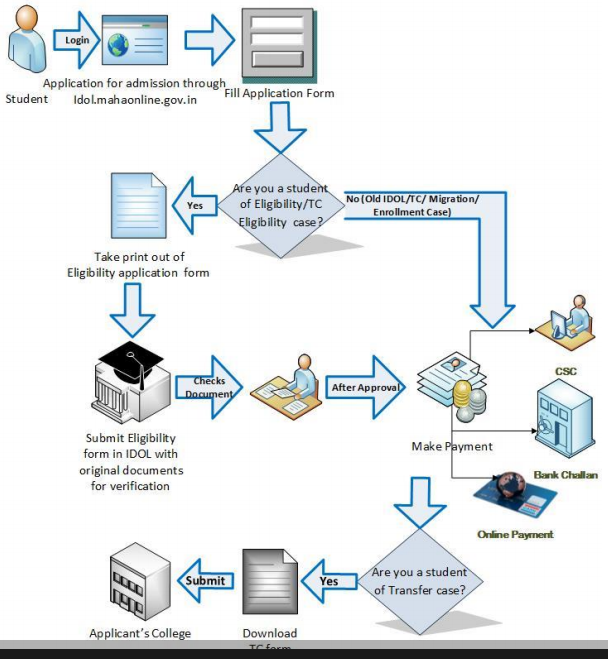 Below is an infographic which explains the admission procedure for Mumbai University Institute of Distance and Open Learning. For more information about the eligibility criteria for distance learning courses & their fee structure, students may download the prospectus or can visit Mumbai University official website for Institute of distance and open learning. For personal contact program, students are required to visit their nearest study center. There they will find a detailed timetable for PCP. Personal Contact Programs are commenced from November every year. An identity card is must to carry for all students whenever they visit IDOL or attend any lecture. Attendance and practicals are compulsory for B.Sc./M.Sc. IT/Comp.Sc/ and MCA Programmes. For B.A./B.Com./M.A./M.Com Programmes attendance is not compulsory. Study material is available in Marathi & English only. Apart from Study material, students can also avail the facility of the virtual classroom, audio video center, and Library by visiting the university. Examinations are held twice in a year i.e first half & second half of a calendar year. 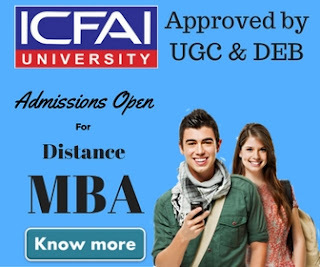 All courses offered by Mumbai University Distance Education are approved by Distance Education Council, New Delhi. 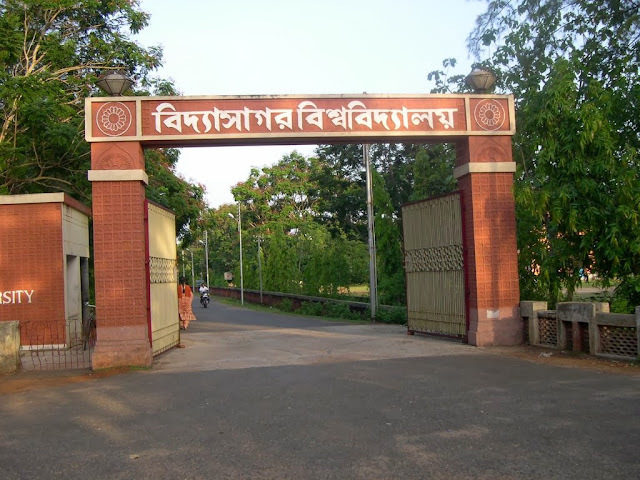 Vidyasagar University is a state government administrated university located in West Bengal, India.The University was established in the year 1981. The university was named after Pandit Iswar Chandra Bandyopadhyay known as Vidhyasagar. The university runs distance education courses under Directorate of Distance Education (DDE,VU) for conducting post graduate studies in distance mode. The university started offering distance education since 1994 with aim to provide higher studies to people who can not attend regular courses. Students who joins these courses got study material from the university & also get a chance to join personal contact program (PCP) where industry experts give answer to students queries. All the courses offered by the university are approved by UGC & DEC.
As we've mentioned earlier that Vidyasagar university only offer post graduate courses. The following are the courses offered by the University under distance education. All the bridge courses are of one year duration, other courses i.e M.A, M.Com, M.Sc & M.B.A are of two years duration. Every year Vidyasagar University publish an admission notification on it's official website http://dde.vidyasagar.ac.in .For some courses students need to clear a national level entrance test. We recommend our blog reader to visit university official website for detailed eligibility criteria & admission procedure. Some of the details are as follow. People from all age groups are welcome to take admission into all the courses. Candidate need not to serve any transfer certificate to take admission into these courses. University will verify your documents before giving you admission. Admission notification for 2017 is about to publish by the university. Student may keep a track on university's website for such information or can contact university officials on the detailed provided below. The Tamil Nadu Open University was established by an Act (No.27 of 2002) of the Legislative Assembly of the Government of Tamil Nadu. The university was formed with an objective to make higher education reachable to those who don't have access to it specially physically challenged, working men and women, economically weaker sections of the society, and those who discontinued education for various reasons, etc. As of now Tamilnadu Open University Distance Education is offering various programmes including Professional Programmes, Post Graduate Programmes, Under Graduate Programmes, Diploma Programmes, Certificate Programmes, Vocational Diploma Programmes, B.Ed. Programmes and Catering and Hotel Administration Programmes. The university takes admission in all the courses except courses in Catering and Hotel Administration twice in a year. A detailed eligibility criteria & admission procedure for each course is available on Tamilnadu Open University Distance Education official website. we encourage our blog readers to visit the official website for a complete information about how to take admission in Tamilnadu Open University Distance Education courses. For most of the courses the university invites application twice in a year. You can also contact the university officials on the below mentioned contact details for more information about the admission & courses.